Well, another year is behind us. Time seems to slip by faster and faster as I get older. The turn of the century was so huge. It's hard to believe that was seven years ago already. We've had our ups and downs this year, as I'm sure everyone did. Looking back, I'd say 2006 was a favorable year for us. Valerie sure has made everything more interesting. It's amazing how much she has grown and learned in just a year. We watched her learn how to walk, talk, sing, climb, and dance. She grew from a baby to a toddler overnight it seems! Overall, we managed to avoid any major setbacks. I found some great friends! I had lots of fun getting to know all the mom's in the playgroup. I finally took a few cake decorating classes that I have longed to do for years. I managed to drop below my pre-pregnancy weight, only to get pregnant again with in a few months after doing so! lol I was involved in my first fender bender, and Clint followed by being in a wreck a few months later. Clint took on more responsiblity at work (job security! ), decided to go back to school, traveled around the U.S. and then to Canada. Goals for 2007?? Save more money and keep better track of our finances. I would LOVE to at some point declutter my entire house! inside and out!! And keep the whole house cleaner. That will be a tough one though. And of course, work on dropping the baby weight after Veronica is born. It looks like tonight will be a low-key New Year's Eve for us. We're still not over the sickness, so it's probably best we just stay home and rest. We're going to make nachos and hopefully some of the neighbors will pop fireworks. I'm pretty sure we'll be sound asleep by midnight anyway! Happy New Year, everyone!! Best wishes for 2007! We're all still pretty sick. I'm SO congested and there isn't much medicine I can take. I'm trying not to take anything at all, but it's tough when you can't breathe!! I'm so tired. None of us have gotten much sleep the past few nights. Last night I tried EVERYTHING to unstop my nose and relieve the sinus pressure - hot shower, steam, vicks, menthol cough drops, more steam, warm compress, the vaporizer.... nothing made any difference at all. Finally about midnight I caved and squirted some Zicam. Instant relief and I was able to get a couple hours of sleep. The jury seems to be out on if Zicam use during pregnancy is safe or not... so I'm only going to use it as a last resort. Clint is pretty sick too. At least he can take meds though. He slept on the air mattress in Valerie's old room because his snoring has been SO bad. I don't think he got much sleep because Valerie was up several times. Valerie was doing better. Yesterday my parents came and she played outside in the wind for a couple of hours. Today, she's all congested again. She still has a horrible sounding cough and her runny nose is back. If we can stick it out until Tuesday, I'll be taking her to the doctor if she isn't better. Urgent Care wasn't much help last week, so there's no point in taking her there again. We're invited to TWO New Year's Eve parties, and as of now it looks like we will miss them both. Valerie was playing on the couch this evening while I sat on the loveseat. (Our NEW furniture BTW!!!) She was being her silly self and babbling away. All of a sudden she looked at me and said "yuw you mommy." Translation: Love you, Mommy! Awwwww.... my sweet little girl!! That just made my day. So yeah, our furniture is here!!! Now instead of having NO couches, we have too many. Waiting on the rental place to come pick up the crappy stuff. Can't wait to have my living room in order again. Christmas turned out okay, over all. We spent almost 4 hours Christmas Eve in Urgent Care getting Valerie some medicine. I really did not want to bring her there mainly because I knew it would be a long wait, and that there wasn't much to do for her. Any kind of viral infection just has to run it's course. Clint wanted to go anyway though to be on the safe side, so we did. We were the 7th person in the door, and it was over THREE hours before we saw the doctor!! And as I thought, Val had a viral respiratory infection that has to run its course. We did get a good prescription decongestant for her out of it. After all of that, we came home, ate a quick lunch, and started to get ready to go to my mom's. We were so late getting there. And I was so tired. Valerie was cranky and not wanting to eat. She was all about opening her presents though! And everyone elses! lol Once she caught on to tearing off the wrapping paper, she was all over every box she could get her hands on. The contents made no difference - everything was "Oh WOW!" lol It was pretty fun just watching her have such a great time. Funny thing though.... duplicate gifts were the theme this year!! Clint got me a jewelry armoire. My mom got me the exact same one! Clint got me a massage mat, and my dad got the exact same thing for my mom. I gave Clint a manicure set, and my mom gave him one too!! And "Santa" had a magnadoodle for Valerie, and my mom bought one for her too. Weird stuff. Christmas Morning Valerie woke up about 7ish cranky and crying. Poor baby was SO congested and snotty. We set up the video camera before getting her out of bed. Almost the instant she saw the presents that Santa had left, she quieted down. She stared and then started pointing at the toys... and ran over to her play kitchen to investigate. More "Oh wows" followed as she looked it all over. It was so neat watching her. We opened every box and just let her play with everything on the living room floor. Mostly she played during the day and had a good time, but she did her share of crying and whining from being so sick too. Poor baby. And she's STILL pretty sick. She luckily isn't acting all that sick though. Her cough isn't as bad, but she sounds awful. And her poor nose is constantly running. She hasn't quite caught on how to "blow" yet either, so she's constantly whining "nose nose!" wanting us to wipe it. I brought her to my mom's to spend the day today, and she did fine according to them. I had an O.B. appointment today. I saw the nurse practioner and she gave me some iron pills to try. She said I may be anemic and that's why I feel so tired / bad all the time. I go back next week for bloodwork to check it out. I'm so aggravated though... the office girl has my payment info all mixed up. I was told if I couldn't pay the $500 deductible, they usually waive it. So I said great! Who in their right mind would argue differently?! I would be responsible for a little over $300 of the bill and I had six payments of $68. Easy as can be to pay that so I paid half of the entire balance. Today there is a new girl at the desk, and she tells me that is all wrong. I have to pay the deductible, which brings the total to over $900! There's no such thing as waiving the deductible and the other person had it caculated wrong. So now basically we have to come up with the money all at once since I've barely paid $200, when we could have been paying on it all along!!! Grrrr. Oh and GOOD NEWS ~ Ashely furniture called.... My furniture is in!!! They'll deliver Thursday!!! A couple Christmas pictures. With Val being sick and me not feeling great, I really didn't take that many. Why does my baby have to be sick today ~ Christmas Eve?? We had a rough night. She slept for the most part, but she was up whining quite a bit too. And coughing. She has the most terrible sounding cough. *sigh* I so want her to have a good Christmas. Urgent Care opens at 10, so I guess we will be heading over there first thing. Val's sleeping now. We gave her a bath at 5am and I put the vaporizer on. She's been sound asleep for a couple hours now, so hopefully it is helping with the congestion. I hope the doc can give her something to make her well quick! We took Valerie to Chuck E. Cheese on her birthday. She had a fantastic time! We told them at the front it was her birthday, and she got a birthday crown, a ballooon, and a candy cane. Later, Chuck E. came out and surprisingly Val wasn't scared of him. She'd wave at him but wouldn't get too close. Val even went up to the stage area to dance to "If You're Happy and You Know It" with Chuck E. and the other kids. We asked her a few times if she wanted to dance or give Chuck E. five, and Val's answer was a very short "No." lol But she'd wave at him and blow kisses. They brought out an ice cream sandwich with a candle in it and sang happy birthday to her. Val loved every minute of being there, and I'm so glad she had such a great day. We moved Val into her new room! So far she's sleeping about the same as usual in there. It's not completely finished, but I am working on it little by little. Her furniture is in place and most of her clothes have been moved. I'm trying to sort through the toys, and I just don't know what to do with them. She has SO much stuff and I can't decide where to put some of it! Tomorrow night we are going to my parents' to exchange gifts. We always have a little party over there and open presents. They are coming to our house Christmas Day and Clint is cooking dinner. I can't wait to see Valerie's reaction to all of her presents!! The look on her face opening some of her birthday gifts was priceless. I can't wait to see her Christmas morning. I hope everyone out there has a wonderful Christmas!!!! Happy Second Birthday to my sweet little girl!! Momma loves you very much!! It doesn't feel like Christmas at all. I just feel so.... blah. I'm just not motivated to do anything. Usually I'm listening to Christmas music and looking forward to Christmas Eve and Christmas Day. This year I'm just not into it. And I feel bad because I want Valerie to have a GREAT holiday. I want it to be special for her, but I find I'm forcing myself to be festive....or pretending. I'm just not myself anymore. I felt so sad walking around the mall this morning. There's all the holiday decorations, Christmas music playing, fab sales, people.... I'm usually so into that stuff. This year, I'm just here. I know by next week I'll feel like I missed Christmas. I just don't feel good. I'm so tired all of the time. I want to be cheerful. I want to enjoy being pregnant. I want to love Christmas. But so far, I'm not. Maybe it's hormones. or a chemical imbalance. I just don't know what to do about it. I realized last night that in just about 10 weeks I will be full term. Ten weeks. That doesn't seem long at all. I'm starting to freak out about experiencing birth again. It was not exactly pleasant. Although I do know more about what to expect, I know I'll panic anyway. I'm starting to freak about caring for a newborn again. Valerie was such an easy baby. What if Veronica is not?? How will I handle dealing with a newborn and Valerie by myself day after day?? How will Valerie handle a baby in the house? I don't want her to feel left out. How will she handle our attention being diverted to another baby? 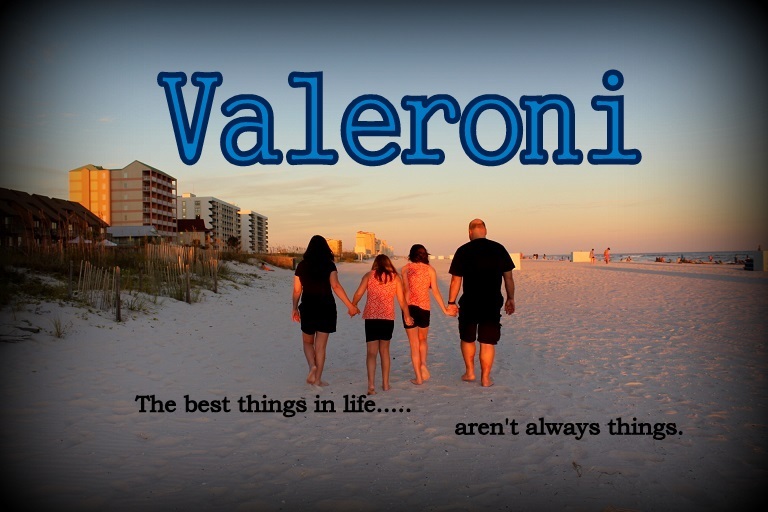 Val is the center of everything now... I feel guilty already. And we have no plan on what to do with Valerie when I go into labor. My parents are the only ones who are able to keep her long term. But what if I need to go to the hospital in the middle of the night.... then what? They can't drive all the way here in the dark and what if there's no time to take Val to their house? We need to figure this out soon.... I will be so worried about her. Valerie's party went well! I think (hope!) everyone had a good time. Valerie got awesome gifts from everyone. I was so tired before the party even started. Everyone who said they were coming did! I think Valerie was a little confused about having so many people at her house. She did get a kick out of everyone singing happy birthday to her though. And she played a good bit with the kids. Her room was a total wreck by the time it was over. Literally every basket and her toybox had been emptied onto the floor. lol Clint did his Santa routine. He was going to come inside, but the look on Valerie's face when she saw him at the door made him decide to stay on the porch. It worked. The kids loved it - at least most of them did. Once the party was over, I was so wiped out. I sat on the couch while a few friends helped clean up a bit. Last night I felt just awful! I have never been so drained in my life. I love the holidays, but in a way I will be glad when it's all over. Not that things will slow down... because we have several birthdays in January. February is our anniversary and Mardi Gras... then of course March is my dad's birthday, Clint's birthday, and Veronica will be here!! We are hoping to have Val moved into her new room this week. All we need to find is a rug. I still want to get a few other things, but once we have a rug down we can move her bed. I hope it won't be too hard for her to adjust to sleeping in a new place. I ordered Veronica's crib today. I have looked and looked and looked... Finally I decided to just pick something. I got this one from Amazon for $247- free shipping. Clint made me so mad last night. He took a shower, and when he came out of the bathroom he had on the full Santa suit. Basically he threw open the door and yelled HO HO HO! Poor Valerie was right there and it scared the crap out of her! She screamed and cried. She was hysterical and trembling!! I told him to put it on but to let her see him put it on so maybe she'd realize it was Daddy playing dress up. I didn't tell him to pop out and shock her. So after that, he tried putting on just the hat or just the beard and she'd cry. Santa is supposed to come to her party tomorrow, so now obviously that isn't a good idea. I think what we'll do is have him stay outside and anyone who wants to see him can go out on the porch. Maybe it won't be as bad if he's not in front of her. Who knows... maybe she'll be scared of Santa for life now. We got a lot taken care of yesterday. I finished Valerie's cake!! I'm happy with how it came out. My house is mostly clean, thanks to my parents and Clint. We just have to de-clutter the kitchen and pick up a little bit. Today is Halliburton's local Christmas party. I am not sure if I will go. We still have things that need to be done around here. And last night I felt just awful from being on my feet all day. That was another thing I was mad about -- Clint has pretty much refused to rub my back during this entire pregnancy. Here I am, just about 7 months pregnant, in tears some nights because my back aches so much, and not ONCE has he ever rubbed my back. I've mentioned it to him, and all he says is "I'm sorry." I don't know what that's about, but really... he could give me 5 minutes of his time to make me feel better. I can't believe my baby girl is going to be TWO YEARS OLD in less than a week!!! Yesterday we watched her first birthday DVD. *sigh* She was so little! It was so weird watching my tiny baby eat her cake and giggle for the camera. She has changed so much in the past year. Looking at her now she is really a little GIRL and not a BABY anymore!! Just in the past few weeks she has started talking so much more and better than she was. I need to start teaching her more sign language in hopes that Val will pass it on to Veronica later on. Today we're getting ready for the big birthday party. I'm going to start her cake in a little while. Clint has promised to help clean (we'll see if that happens.) My mom and dad are coming to help later on I think. Food wise, we decided to take the easy way out and order a variety of pizza! After baking the cake and decorating it, I know I won't be in any mood to cook. Pizza and breadsticks = easy! What is it with people not saying thank you these days? Twice now... two different people for two different occasions... I have put a lot of thought into sending gifts. They were delivered, but the recipient never acknowledged them. And Yes, I KNOW they were received. I took the time to find something nice and these were $30 presents, not dollar store junk. A simple email saying "thanks for the package!" would be sufficient. Valerie is back to her normal self today. I guess it was something she ate that made her sick yesterday. Either that or one of those short viruses. She was up a few times during the night asking for juice. She's eating fine and playing as usual. Well... Valerie has thrown up 5 times in the last few hours. Lovely. She seems fine. Playing and babbling. But as soon as she eats or drinks anything... blech all over. Hopefully it's just a quick 24 hr. bug. If we had our new funiture / rugs... she would have vomited all over it. Clint rented some furniture today. $20 / week plus tax and insurance. It'll be here tomorrow. I just can't deal with having NO furniture. Funny thing is they have the very set we have on order with Ashely for $27 / week. We could have gotten that and just "pretended"! lol! But at this point, cheaper is better. Saturday morning we took family pictures at Olan Mills. Surprisingly, Valerie did great and smiled! A total turnaround from when we tried to get her picture last week. Having both of us there in the pic with her seemed to have helped. I only got one pose for the $5 package special. Saturday night we went to our MOMS club Christmas party. It was great! All of the kids got a small gift and the adults played a game for gifts we brought. We had lots of food of course! Valerie had a blast. She was all over the house playing with the toys and other kids. Yesterday I woke up feeling just awful. I don't know if it was something I ate at the party, lack of sleep, or just from being so busy lately. I felt bad all day. The furniture deal has me so stressed, there's so much I want to do before Val's party, and all the holiday stuff coming up too... I think mostly it's the furniture thing. I know there isn't anything to do about it, so I should just let it go. I just want everything for Val's party to be nice. Having a sofa won't make or break the party, but having an empty living room just seems awkward. We were supposed to borrow a sofa from someone, but that seems to have fallen through. I'm not sure what happened. My dad drove all the way here in his truck, but when we went to get it no one was home. And I had talked to her a few hours earlier and she said they weren't going anywhere. So, I kinda have the feeling she wasn't serious about loaning it to us... We may try to rent something this week. Well, yesterday feels like it was a completely wasted day. All I did was the stupid furniture crap and nothing else. I'm working on a complaint letter to the CEO of Rooms to Go. Not that it will do any good as from what I've found out they must get hundreds of complaints a day. But I want my complaint heard by somebody!!! In the mean time, my friend that bought my old furniture still has her old couch and loveseat. I'm not about to take my furnture back from her! So, we are going to maybe borrow her old couch for a couple weeks until my new stuff comes in. The only problem is the earliest Clint can access my dad's truck will be Sunday. So, until then we are furniture-less! RTG just better credit us back the $140 sales tax we paid on our furniture though. I've already filed a claim with Discover about it. Today was not a good day!! I also tried to have Valerie's pictures taken at Olan Mills today. That didn't go over very well either. She cried and screamed everytime I put her down. She just refused to stand by the backdrop and wanted me to hold her. So, I had to reschedule that too! We are going back Saturday morning to try again. DO NOT EVER BUY FROM ROOMS TO GO!!!! They have the WORST customer service. The WORST delivery service. It's ridiculous. My furniture was scheduled for delivery between 2pm and 6pm yesterday. At 5pm, I received a call saying the delivery driver was running behind schedule but I would receive my furniture that day. At 7pm, another caller said the same thing - he was still late but I would receive my furniture that night. At 9:40 pm (yes that late) ANOTHER caller said the driver was 40-50 miles away, and would it be better to reschedule in the morning since it would be so late. I said fine, thinking nothing of it, and the caller said to expect delivery between 7-8am this morning. So I called to find out when it was coming. I was told dispatch was going to contact the driver and call me back. That call never came. I called again at 11:30, and was told that THERE WERE NO TRUCKS COMING MY WAY!!!!! WTF??? And that my account was locked for 48 hours, and I would have to wait until tomorrow to call and re-schedule delivery. After a few more calls, Clint talking to several people, calling the New Orleans store directly a few times, we find out that the warehouse is in ALABAMA. MY FURNITURE WAS RETURNED TO ALABAMA!!!!!!!!!! IT WILL BE ANOTHER WEEK BEFORE DELIVERY CAN BE SCHEDULED AGAIN!!!! After all the run around - we will probably cancel it. A manager is supposed to call back. Their only solution seems to wait another week, which is NOT acceptable. If they can't come up with something else, we are canceling it. I just don't want to deal with them. So I have NO living room furniture. *cries* Valerie's party is in a little over a week, and we will have NO furniture!!!!!!!!!!!!! I really liked this furniture too, and it took SO long to find something I liked. I am SO NOT HAPPY right now!!! !